Originally, I had sat down to review another Christmas themed horror movie and decided I’d throw in ‘Psycho Cop’ as a warm-up. 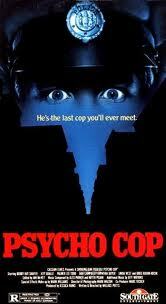 It seemed like just a second rate rip-off of Maniac Cop and I could half ignore it as it went through the motions. It turns out I was very wrong. I didn’t get much of anything done as it wove its spell of strange incompetence. Christmas had come early. The plot for ‘Psycho Cop’ is about as standard as they come; we’re introduced to Officer Joe Vickers, not only a psycho but also apparently a Satanist as evidenced by his habit of writing 666 or drawing a pentagram everywhere he goes, for no particular reason. After dispatching a couple of lost drivers, he begins stalking a group of teens who are on their way out to a house in the middle of nowhere to party for the weekend. There is a hunky yet somewhat weird caretaker and uh… that’s about it, save for the occasional filler kill to pad out the time, Psycho Cop sneaks around, someone sees him and thinks he’s a legitimate cop, he kills them. Repeat. So, imagine you’ve written a slasher script in 1989. Freddy Kruger is still a popular figure, and his brand of a killing followed by a witty comment is still a viable way to write your film. You write your script, but those witty comment parts are hard to come up with, so you just throw in some filler lines like, “Looks like you need a police officer,” or “… you’re obstructing justice.” You figure you'll get back to those and write in some real gems after you've worked your way through a couple more glasses of gin.Then you end up in jail after your gin soaked rampage and sell your half completed script to cover lawyer fees. It's the only way I can rationalize scenes like: There’s an evil cop on the roof of a car, grabbing the steering wheel and just saying, “You’re turning, you’re turning, you’re turning…” over and over as he makes it weave around the road. Somehow, against all odds, it works. I have no idea how or why. The teens are only differentiated by a single characteristic, such well thought out things like: “Listens to a Walkman”, “Likes to brush her hair” and “Enjoys beer.” For some reason the caretaker, nobody wants around gets killed early on and then is incessantly talked about for the rest of the movie. Officer Joe Vickers is the least menacing psycho to ever grace the screen. He’s kind of friendly looking even when he’s murdering. He’s got this lopsided grin and bugged out comedy eyes. If he wasn’t a psychotic murderer, he’d be the kind of guy who makes fart jokes when you’re trying to talk to your boss on the phone. He'd be a good Satanic drinking buddy. The movie delivers scene after scene of bad movie magic, everything from Officer Vickers tasering a guy to death, while he holds him by the throat, to the Vickers getting impaled by a tree limb, which has no sharp points, thrown from a prone man twenty feet away. It’s bad movie genius and I think it’s definitely worth taking a look.